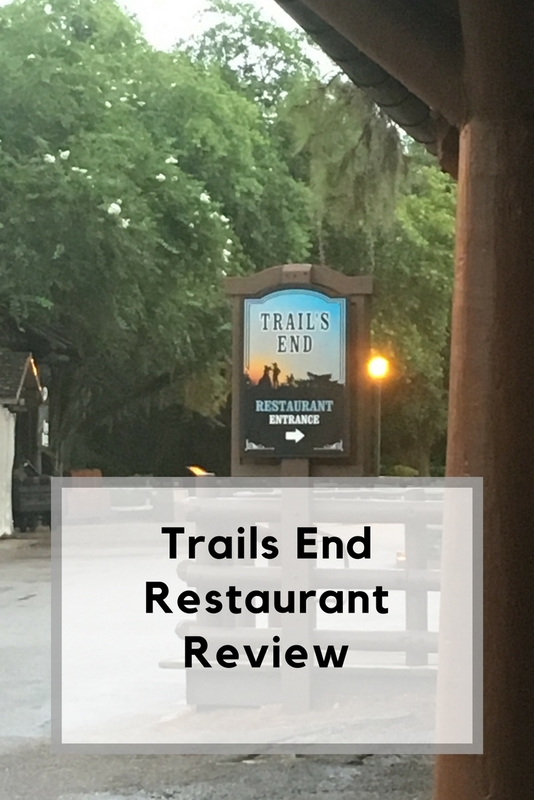 After our amazing experience at Hoop De Doo Revue, we were looking forward to returning for a meal at Trails End restaurant, the other one of the Fort Wilderness restaurants. Trails End is located right next door to Pioneer Hall. The weather was questionable during the afternoon we visited, so we made the decision to take the boat over from Magic Kingdom early again. This was the right idea as no sooner had we settled ourselves under the balcony enjoying our drink, a massive thunder storm arrived. We were watching people get off the boats soaked, whilst we were cosy and dry. Trails End restaurant also has the bar for all to use at the front, and the quick service area tucked into the end of the restaurant. It felt a little disjointed, especially when we were eating our meals with resort guests trying to sit down around us with their quick service food orders, to be told they couldn’t stay as it was for table service guests only. The size of Trails End restaurant however is huge. There are two levels in the restaurant making it perhaps appear bigger than it is. We had a seat very close to the buffet and far away from the bar area. This suited us really well as we didn’t have far to walk each time we wanted more food. Our reservation time was for dinner time, but when we checked in a little early we were told they weren’t busy so could be seated immediately. 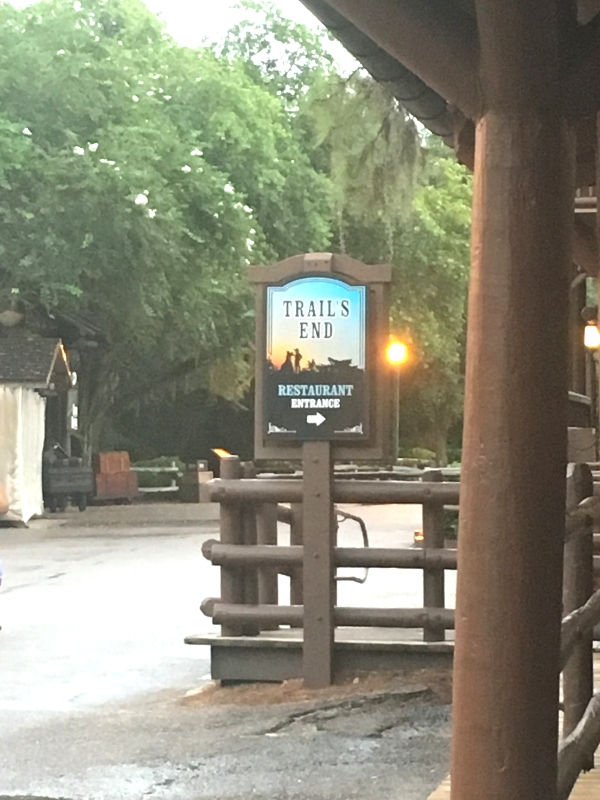 I had researched before arriving and learned that Trails End restaurant is one of the less popular choices for table service meals. It’s not amazing value for money if eating on the Dining Plan, however it was still a restaurant we wanted to try. If you’re eating off the Disney Dining Plan however, and want a Disney buffet option Trails End buffet may be a good choice for you. The menu choices are also very similar to Hoop De Doo Revue next door. The buffet area was small in comparison to some of the character meal restaurants we have previously visited such as Crystal Palace in Magic Kingdom. However there was a good variety of foods on offer including the amazing fried chicken and ribs we had enjoyed the night before. The buffet area was laid out well with salads, breads and sauces, before moving onto the fried chicken, ribs and then the carver station. We also found plenty of different vegetable choices on offer with mashed potatoes, fried and jacket potatoes. You certainly wouldn’t go hungry. I was impressed with the theming of the restaurant, and the cast members were fitting with the theme as well. Unfortunately for us, our serve just didn’t seem interested in working that day. I hope it was a one off, but it did ruin the experience for us a little. We all found the food to be good quality and we certainly didn’t leave hungry by any means. The hot chocolate was also a lovely change to the drinks on offer, as I think we were all getting a little tired of fountain drinks at this point. Perhaps if we hadn’t had such an amazing experience at Hoop De Doo Revue the day before, our experience of Trails End restaurant may have been a little more positive. We didn’t stay too long after our meal and chose to return to Caribbean Beach Resort to see what movie was playing. We went to Trials End restaurant once for breakfast a few years back and decided to give it a try for dinner. Once you find a place to park at the front part of the campground, you have to get a bus back to the restaurant. We have seated right away. Dinner is a buffet and the food is rather good. The one downsize is, the place where the buffet is located is not that large. It creates some back-ups in line. This is also located near Hoop de Doo and if you do not time it right, you have the larger crowds outside waiting to get into Hoop. After eating I would suggest walking across to the trading post. You can also catch a boat to MK if you wish to have breakfast or lunch here. It looks very interesting! If I visit here with my family, that must be nice. It looks like a perfect place. We need to relax and enjoy our time with our family.